The current spell of cold weather that the UK is currently experiencing presents potentially challenging driving conditions. In order to safely arrive at your destination without incident, it is wise to follow a few mostly common-sense tips. Carry out regular visual checks on your road tyres. They may well have been fine last week, but driving through snow, ice and sludge means that you are potentially driving over hidden hazards which may damage your tyres. So, be mindful of keeping an eye on them. As well as obvious damage, look out for cracks, bulges or cuts in the tyre – all of these are signs of pending tyre replacement. Check the spare wheel if you carry one. Again, hidden hazards on the roads within challenging conditions can result in a puncture. If your spare is flat when you change it, it’s not going to be much use and you might be in for a cold night if the breakdown trucks are busy. 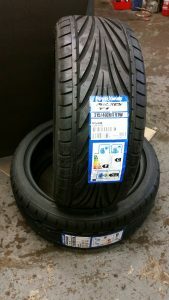 Check your tyre depth, or book into AGS garage services for a check-over if you are unsure how to do this. As a guide, the minimum legal tread depth is 1.6mm across the central 3/4 of the tyre, looking at the entire circumference. 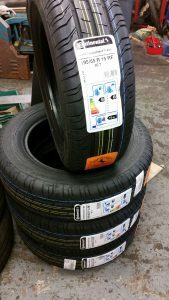 If you are near the 1.6mm, it’s sensible to fit new tyres as the effectiveness and performance of a worn, barely-legal tyre will be somewhat less than a new tyre. If cost is an issue, consider the cost of an accident in terms of damage, potential time off work due to injury and insurance costs such as excess payments and a hike in your premium next time round – all of a sudden the cost of the tyre(s) seems less of an issue. Check your tyre pressures once a month and give them an extra check before a journey in cold and challenging weather. If you don’t know what your tyre pressures should be, look them up in your vehicle’s manual or ask an expert. Again, a short service at AGS garage services will cover items such as this. Ensure that you have breakdown cover. In the event of an incident in cold weather which damages more than 1 tyre, or for vehicles which don’t carry a spare, you will be grateful for the assistance. Again, the cost of the cover is soon forgotten when you really need it. Driving. Mainly common sense here. Firstly remember that you are not in a Formula 1 race and if you are late, it’s better than not arriving at all. Maintain twice the distance between vehicles, remembering that the effectiveness of braking is vastly reduced by the tyre’s reduced ability to grip the surface. Look out for partially hidden obstacles that can damage tyres such as pot-holes and tree debris. Use your head-lights and fog-lights if necessary to assist all of the above.